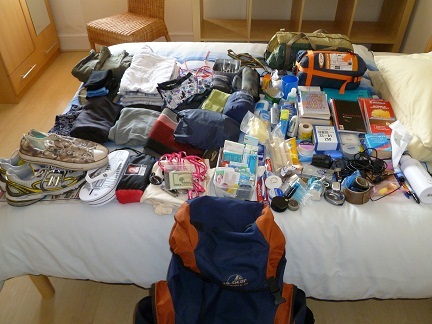 You can read about my 10 must have items for travel in my article for the website travelwithamate.com. Travelling with the smallest bag I can get away with, space is always at a premium. During Encircle Africa I used a 75 litre bag, but I usually get away with one of 35 litres, with most of the bulk apparently made up of books (an essential so essential I don’t include them on any list). I could probably think of at least another 10 items that are necessary if not essential too. Everything I needed for 13 months of travel. Amazingly, it all fit too. But what about those bits of kit I wouldn’t ever dream of allowing to take up space in my bag – usually from the experience of doing precisely the opposite? Here I count down a very personal list of the most pointless objects to take when travelling. One month into Encircle Africa, on reaching The Gambia, I found my small pack of wet wipes were indistinguishable from a small pack of tissues. So take a small pack of tissues instead. Dictaphones, recording equipment, and camera crews are all a big no-no unless you’re travelling on a journalist visa, which you won’t be. This is one of those things that is difficult to be confident about, differing from country to country. Crossing overland from Libya to Tunisia things not to carry include a list of ferry times from North Africa to Southern Europe. So be aware. 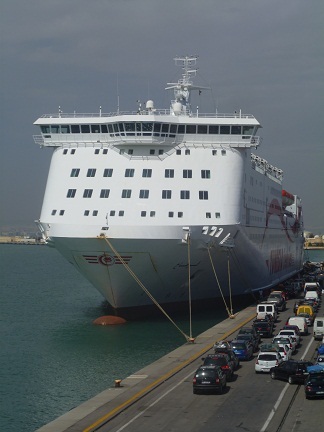 The Carthage, my ferry from Tunis to Marseille. Noting down its sailing schedule led to accusations of journalism. Designated supermarket travel wash is comparatively expensive, hard to find abroad, and rubbish at cleaning. Buy a local bar of soap instead and give any clothing that needs it a decent scrub in a sink. You could go as far as washing yourself with it too (though I do take shampoo). I can’t abide money belts. They’re hot, sweaty, ugly skin irritants that are almost always clearly visible to anyone who wants to take the trouble to relieve you of it. With sachets of money dispersed all about my person and bag I never felt under threat, and much more relaxed than when wearing such a belt. I now travel with a single pair of trousers and another of shorts. I don’t need anything more then to be able to alter my clothing relevant to the weather, with something to change into when an item is in need of a wash. I follow the same rule with footwear. I have a pair of running shoes (rather than walking boots) on my feet, and small lightweight flip-flops in my bag. That’s it. I used to carry another pair of shoes, but never got round to using them. Any form of spare clothing is almost guaranteed to be a complete waste of space. Unless you’re a professional photographer you’re never going to need that spare camera battery you were convinced would be essential; and standard battery sizes are available absolutely everywhere there is any human presence. I’d go as far as saying don’t bother take anything that needs a battery or a plug; my exceptions being a camera and a small short-wave radio. I’ll allow you to take a mobile phone too – but remember you’re supposed to be travelling.